Leaf from the Natural history, recto. Nicolas Jenson (1420-1480) was Master of the French royal mint. He was sent by Charles VII in 1458 to Germany to learn to be a printer. When Charles VII died in 1461, Jenson moved to Venice where he established his printing business. 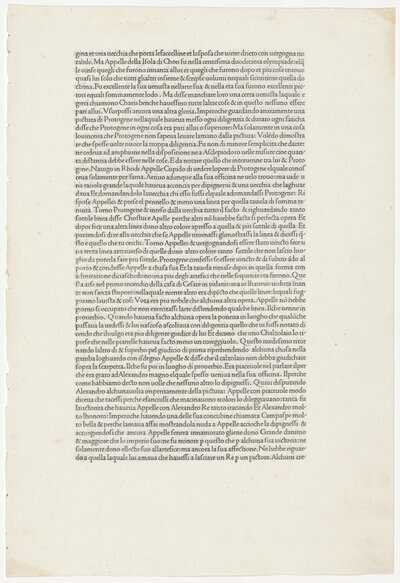 He was noted for his use of Roman type, which was modelled on the hand favored by the Renaissance humanists who emphasized the study of ancient Latin texts. ... read moreLayout: printed in 50 long lines per page. Originally printed by Nicholas Jenson. 1 leaf (printed on both sides) ; 39 cm. 1476. Send Comment about Leaf from the Natural history, recto.